Norwalk's Sanaa Boyd hugs a friend after the team beat New London during Saturday’s Class LL championship game. 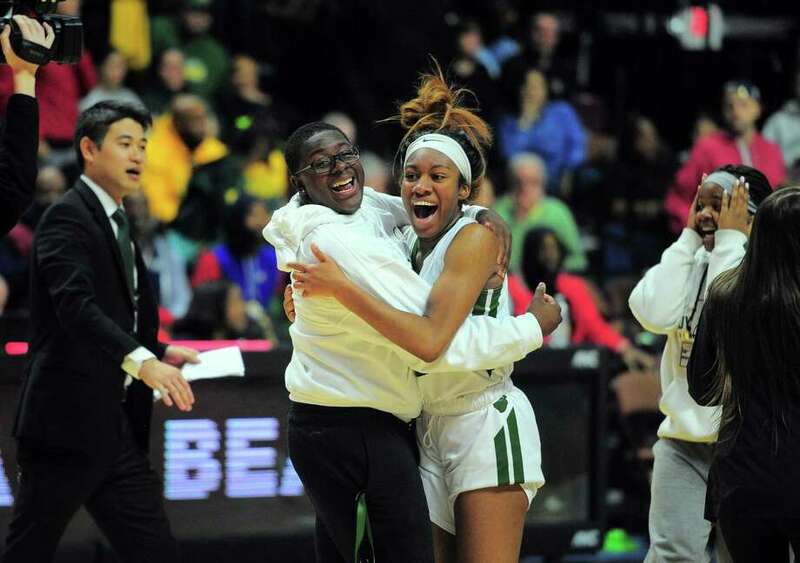 UNCASVILLE — The Norwalk girls basketball team was eight minutes from seeing its unbeaten season end in the worst possible way in the CIAC Class LL championship game. The No. 1 Bears were down 11 heading into the fourth quarter to No. 2 New London, but rather than folding, they began to chip away at the lead. The Bears tied the game with 1:10 to go on a 3-pointer by Ashley Wilson. Xaryia Melendez gave New London back the lead on a layup of her own but two Wilson free throws with 45 seconds left tied the game again. A turnover, one of nine by New London in the fourth quarter, gave Norwalk the ball back with 29 seconds left and Norwalk coach Ricky Fuller let his players go, not calling a timeout. Anaijah Morgan drove down the key, dishing to Naeva Rene under the basket, and Rene’s layup with :02 left on the clock completed the improbable comeback for Norwalk 55-53 over the Whalers. It is Norwalk’s third state championship, and its first since completing an unbeaten season in 2000. For the Bears, the game could not have started any worse, as they went down 12-0 before scoring their first basket with 1:30 left in the first quarter. New London built the lead up to as much as 13 points in the second quarter, leading 33-24 at halftime. Norwalk outscored New London 19-6 over the final eight minutes, largely behind a swarming defense. New London was playing in the LL championship game for the third time in four years, winning in 2017 and losing in 2016. Pagan’s fifth foul came on a controversial call with 45 seconds left in the game. New London’s Joniyah Bland-Fitzpatrick ran into her teammate, losing the ball with no foul called despite protests from New London claiming Bland-Fitzpatrick was pushed by a Norwalk player. The loose ball was picked up by Wilson of Norwalk and Pagan promptly fouled her. Melendez led New London with 16 points, with Bland-Fitzpatrick adding 14. For Norwalk, Belinda Hunte was the leading scorer with 15 points. Ashley Wilson, Norwalk. Wilson scored 12 points but none as big as her game-tying 3 and later her game-tying two free throws.